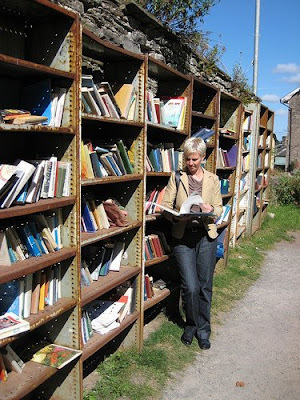 The problem with booktowns is that they are not sourced in the way that normal second hand bookshops are-- local bookshops get their books from deceased estates, people who are moving or downsizing and books brought into the shop. If the propietor is a bit entrepreneurial he or she will go to auctions, visit other shops and generally be involved in running books to earth. I am not totally sure where booktowns get their books but they tend to be a lot less interesting than a local shop and often priced with a much heavier hand. It is said that many bookshops that have closed down have sold their stock to book towns, the trouble is that they have usually had a sale first. Occasionally we tell people with unambitious books or those that are too far away to collect, to drive them over to a booktown - at least there are plenty of potential buyers. Anonymous bookplate designed by Simeon Solomon with his characteristic S upon S monogram. Engraved by S. Wain it shows two Pre-Raphaelite looking women, one seated by a tree reading an old book, the other affixing a banner to the tree which bears the legend ‘content ailleurs’ 2 banners are already affixed with the words ‘labor’ and ‘theoria.’. Attractive and highly uncommon item in vg condition measuring 3” by 4 1/2”. Book towns have their own site I.O.B. 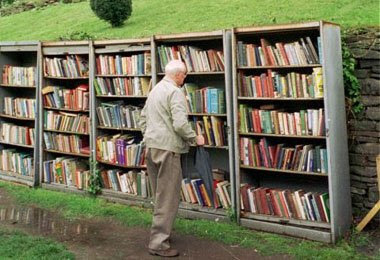 - International Organisation of Book Towns and recognise these towns - Bredevoort (NL) Fjærland (NO) Hay-on-Wye (GB) KampungBuku (MY) Montereggio (IT) Pennsylvania (US) Redu (BE) Sedbergh (GB) St-Pierre-de-Clages (CH) Sysmä (FI) Tvedestrand (NO) Wigtown (GB) Wünsdorf-Waldstadt (DE). Wikipedia lists a whole lot more. It is good to see that the love of books, bookshops and the general unfocussed sentimentality about the book itself is not just a British peculiarity. I have been to three book towns, the best being Hay-on-Wye (or Way on High as Driffield used to call it) - all glories to its King, Richard Booth, probably the most famous book dealer in the universe. 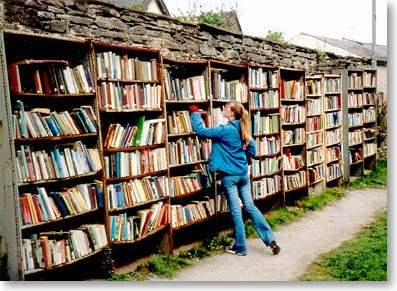 I remember visiting Hay -on - Wye,at customers recomadations. I can only say it was one of the low points of my life - i didn't realise there were so many unsellable,tatty books in existance ! Thousands of volumes of Third World Economics,biographies of every pre-war local council leader.etc. Even the stuff locked in glass cabinets was routine,but at silly price's ,to stop it selling ,i assume. I think of them as a tourist attraction,along with living museums.
" Booksale for Charity " Often a church who has a annual clearout of donated books,some even charge for admission,along with a chance to convert & repent ye sins. Fun places to check out the local bookdealers who mysterious advertise in the local rag,under the guise of " private collecter seeks..."
Of course these fairs are 99% full of Christian biographies and the 1% left have been googled and priced at £10.00 ! Speaking of Rogue dealers,what about a piece on the underhand methods used against local bookstops,like hiding their biz cards inside the bookshop,with little notes saying " do not sell to this bookshop -i'll pay you more " and hanging about outside and acosting sellers before entering the shop.Driff's, i think ,said something about the local rabble who would stake out a shop,until it closed down.